This is a closed (not open to the public), executive session, limited to members of the governing body and others reporting to the body on the subject of the executive session, at the board’s discretion. Any information revealed in an executive session is considered privileged and may not be reported. Introductions. Recognition of time keeper and note taker. Code of conduct. 7:25 PM Discussion: Portland’s commission form of government: Is it time to restructure? A presentation and conversation with Portland Forward and City Club of Portland. As Portland rapidly grows and changes, does the current commission form of government equitably represent all people who live in this city? How should we choose our representatives? What would a more representative and equitable form of government and elections look like for Lents and East Portland? These are the draft minutes from the LNA Board Meeting on April 12, 2019, to be approved at the May 2019 Board Meeting. Reimbursements and payments: Web hosting, flyers, etc. General Membership Meeting: 7:00 PM, April 23, Lents Community Center, 8835 SE Woodstock Blvd. LNA Board Meeting: 6:30 PM, May 9, 8940 SE Reedway St. 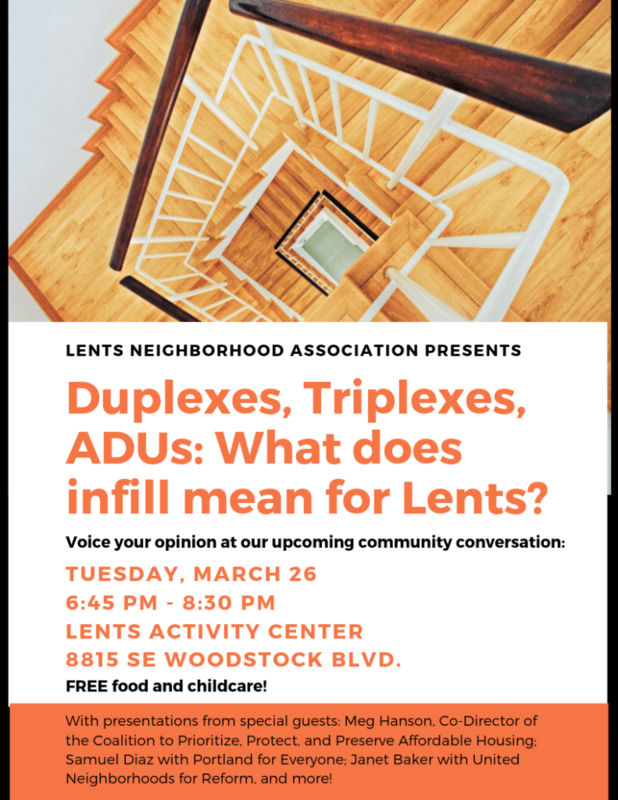 Residential infill: Would more housing help or hurt Lents? These are the minutes from the LNA Board meeting on March 14, 2019, approved at the April 2019 Board meeting. These are the minutes from the LNA General meeting on February 26, 2019, approved at the March 2019 General meeting.